Curiosity, as compared with the Mars rover Spirit. No matter where you stand on the future of human space flight, if you want to visit other worlds, you are probably a fan of robotic exploration. Still, there’re a lot of hurdles to putting even a robot on another planet: budget, scientific squabbling, budget cuts, technological hang-ups, budget shortfalls, political reviews. And did I mention issues with the budget? But putting everything else aside, the scariest moment in any planetary landing attempt is, well, the landing. When you’ve poured years of your life and millions of tax dollars into a little bot with big promise, getting it safely to its destination is the nerve-wracking moment everyone is waiting for. Well, the folks at NASA must be fans of horror movies, because for their next Mars lander, the roving science lab dubbed Curiosity, they’re gonna film and broadcast the moments just before touchdown. The MARDI, with a Swiss Army knife for scale. The downward-facing Mars Descent Imager, or MARDI, will record full-color, high-res video of the two minutes before landing, as the craft comes screaming through the Martian atmosphere and deploys its unique landing system. “Initial frames will glimpse the heat shield falling away from beneath the rover, revealing a swath of Martian terrain below illuminated in afternoon sunlight. The first scenes will cover ground several kilometers (a few miles) across. Successive images will close in and cover a smaller area each second. The spacecraft’s own shadow, unnoticeable at first, will grow in size and slide westward across the ground. The shadow and rover will meet at a place that, in the final moments, becomes the only patch of ground visible, about the size of a bath towel and underneath the rover. 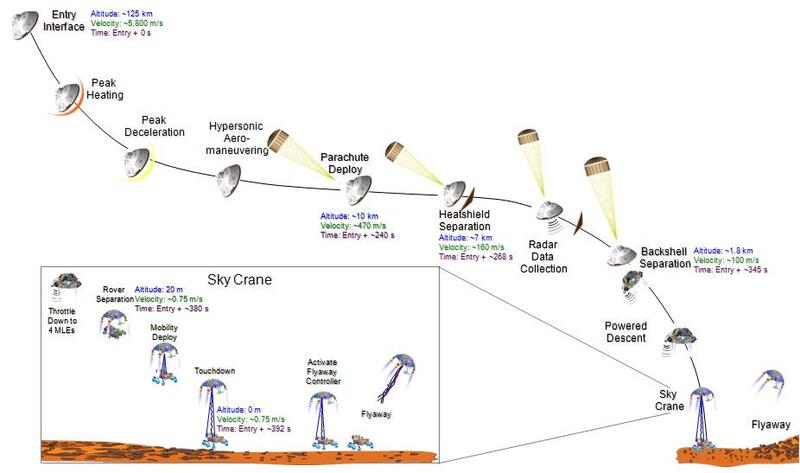 An illustration of Curiosity’s stages of descent. Blow me up for readability. Sounds amazing, eh? But don’t set your Tivo just yet. Curiosity isn’t slated to reach Mars until August 2012, and the video will be too much data for the lander to send back in a timely fashion. At about 150 million miles (250 million kilometers) from Earth, there’s no way the rover will be streaming anything in real time. Instead, images have to be sent via relay through a Mars orbiter, which limits the times the lander can communicate with Earth to whenever there’s a craft passing overhead. Given the delay, the video frames will get sent to NASA piece by piece, enabling a slow progression in video quality. The first version will be comparable to a YouTube video, according to the camera’s lead investigator, Michael Malin of Malin Space Science Systems. “The high-definition version will not be available until the full set of images can be transmitted to Earth, which could take weeks, or even months, sharing priority with data from other instruments,” Malin said in a press release. Eventually NASA will share the “full glory” version landing video with the wide world. But the clip will be more than just an excuse to make popcorn. Mission managers back on Earth can use the detailed pictures of the surrounding terrain to decide on Curiosity’s initial path. And engineers will be studying the data to inform designs for future landing systems. In addition, once landed, the “belly” camera can be used to watch the ground go by beneath the rover, for geologic mapping or for other scientific pursuits.